Severe head injuries can cause skull fractures, which is a break in the skull bone as the result of a direct impact to the head. In children and the elderly, falling is the main cause of skull fractures while in adults motor vehicle accidents are the main cause. Skull fractures can range from mild to severe. They can cause no noticeable neurological damage or, conversely, lead to fatal complications like cerebral edema (fluid buildup that causes brain swelling). In a traumatic brain injury, sometimes the skull can be fractured. Severe skull fractures are usually associated with severe TBI’s. But TBI’s can occur even if there is no blow to the head. There are four major types that range from severe (basilar) to mild (linear). Although certain types of skull fractures are more common than others, they are still serious injuries that require medical attention and supervision. These are the most common of the four, a linear fracture, is a break in the bone that does not involve any bone displacement or movement. 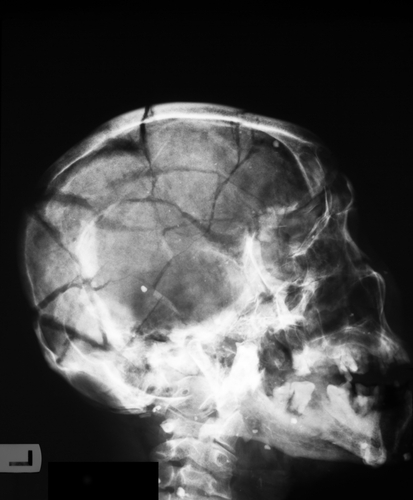 Linear fractures are usually caused by a low energy blunt trauma that diffuses over a widespread area of the skull. Generally these types of fractures do not require extensive hospitalization or medical attention and patients can resume normal activities within a few days. Depressed skull fractures are a severe type of fracture where part of the skull is sunken in from the trauma. These type of fractures are usually the result of a high impact trauma that crushes a portion of the skull, depressing it inwards which can put pressure on the brain. They will almost always require surgical treatment and are associated with higher risks of complications such as infection and abscess formation. Diastatic skull fractures usually occur in newborns and infants in whom suture fusion has not yet occurred. Suture lines are the spaces in the skull bones that make room for a baby’s head to grow. As babies grow these lines get smaller. A diastatic skull fracture is a fracture along the suture lines in the skull. The most serious of the four, basilar fractures, involve a linear break in the bone at the base of the skull. Patients with this type of fracture will usually have bruises around their eyes and ears. These type of fractures can cause dural tears (a tear of the lining of the brain called the dura) which can cause cerebrospinal fluid, a clear fluid that cushions the brain, to drain out of your nose or ears. This type of skull fracture is highly unstable and will require close medical supervision and care.